Home > Starting Up > Will a City B & B Work? When you think of B&B locations, you usually think of seaside towns or a quaint tourist spots. In locations like these B&Bs jostle for space and compete successfully with large hotels. But what about opening a B&B in a major city? Each city has its fair share of hotels, most of which are large chain hotels. What are the pros and cons of setting up a B&B in a city? What Can a B&B Offer in a City? A big city can be daunting, especially if your guests are not used to the hustle and bustle. A B&B is smaller than a hotel and the service more intimate. As a host you can be more reassuring and offer a more personalised service. Guests will feel that you are more approachable and will feel happier knowing you are there. This can appeal to overseas visitors, who will appreciate the slice of British culture you can offer them. B&Bs appeal to guests looking for something other than the generic hotel room. After a few stays in various hotels, they all begin to resemble one another. 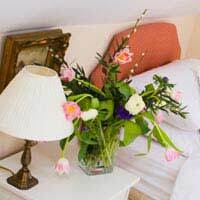 A B&B is unique to its owner and you have the advantage as far as individual charm is concerned. Price plays an important role. B&Bs are much smaller than the city hotels and don't have their overheads. You can offer more affordable rooms and better discounts than your big chain counterparts. You may live in a city which attracts a large number of backpackers. London is the obvious choice, but Edinburgh, Oxford, York and Liverpool are also very popular. Backpackers travel on a budget and will bypass hotels, looking for less expensive, more charming B&B establishments. You could carve yourself a lucrative niche market. Hotels in cities target business or couples markets and tend to have few family rooms, making it expensive for a family to enjoy a city break. A B&B can offer a home from home where parents and children feel more comfortable. You can cater to their needs and make it easier for the parents. Can you Attract Business People? It is unlikely that business people will want to stay in your B&B. Hotels can offer wireless internet, a fax and photocopy service and 24 hour access to food, drink and services. Business people are interested in a comfy bed, efficient service and peace and quiet. It would take a lot to sway them from the hotels they are familiar with, but this might be changing. As wireless internet access becomes cheaper and laptops and smartphones get lighter and cleverer, you might be able to target business people looking for comfort and a good deal, particularly those from smaller businesses looking for the best deals. The night life in a city is more alluring than a tourist town and guests might want to come back late. Do you have a code on the door or do you entrust your clients with keys? If not, you'll have to stay up and wait for them to come back to their rooms. Some customers may prefer to eat their evening meal in the hotel. After a hard day's sightseeing they don't want to hit the streets again to find a meal at night. Unless you are very close to a range of restaurants and bars, you might find it hard to compete with the hotels with restaurants on site. If your B&B is in an older building, noise may be a problem. You will need to have double glazing to shut out the sounds of the city. Thin walls make noise travel and younger guests may come back late and be louder than the average hotel customer. If you have a range of guests, it might cause a problem. Most B&Bs have their quirks, whether it is hot water that takes a long time to get hot or creaking floorboards. City visitors may be less willing to put up with these eccentricities and prefer a modern hotel. As with everything, there are advantages and disadvantages of running a B&B in a city. You will need to research the market thoroughly before deciding to take the plunge, but there's no reason why it can't work.